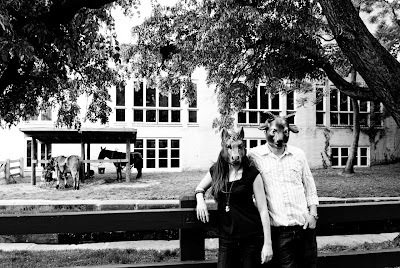 east side bride: How about creepy animal masks? *Plus these photos remind me of some cool black and whites my dad took of my mom wearing a cow mask when she was about eleven months pregnant with me. She was so big you could see the outline of her belly button through her French-y striped t-shirt. wow. this is awesome. 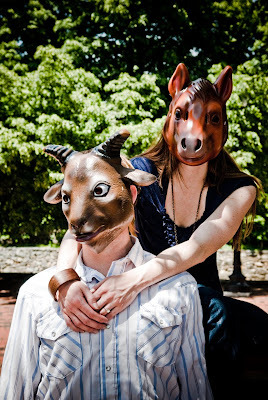 if you can find me a creepy mask to wear for my engagement photos, i'll do it - although, i would love to get my hands on that panda head. Ok. It may be something dating back to my childhood but this totally and completely creeps me out. as in a lot. 1) have i mentioned owl's clover to you yet? a friend. animalmasktastic. 2) on masks, what say we all watch that one bat for lashes video? god i love excuses to watch that video. possibly the coolest music video EVER. scary bicycles beat cutesy bicycles any day. Can they go steal things from the five-and-dime after? YES AMANDA. In fact, how bout an entire five and dime shoot? Wait, what's the gestation period of a human being? I don't think I'm cool enough to even look at pics of these people, let alone hang out with them. YES. I love these. I was thinking about getting a couple just to wear around the apartment. Give me a bottle of wine and I'll even lurk around the courtyard making animal sounds and scaring the neighbors. um, whatevs about these masks...i wanna see that photo of your mom. i'm distracted by wanting to see a cow-mask photo of your mom. and her belly button. I agree we need the cow mask and belly button shot, start searching through the shoe box of photographs....please! um. i literally said this to noa two days ago. creepy. I wish they didn't, but masks give me the creeps. There is something about only a person's eyes moving that just freaks me out! Those are too effing creepy for words. I like them. But yeah, bugger the engagement photos, I want to see the picture of your mum. So much better than weirdo harlequin masks! so, i saw these and totally thought of this post.